Creation: Appeared in late 1926 as an original US Highway, following VA 18 from the North Carolina line below Cluster Springs to Halifax, VA 12 to Wylliesburg, VA 32 to Keysville, and VA 20 to end at US 60/VA 10 (now SR 716) Burkeville. US 501 used SR 866 Woody Loop and SR 865 Whitt Loop near the state line, then followed its current path to South Boston, then used the NB split, then VA 129 through town and up to Loves Shop. US 501 then picked up its current route to Halifax. 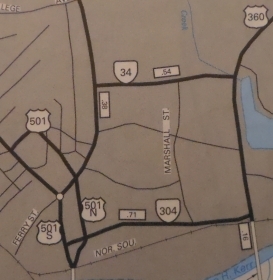 US 501 followed VA 360 east then SR 760 Ferry Trail; Archer Trail; Marion's Trail; SR 613 Bagwell Dr-Wagstaff Rd-Wagstaff Ln (the trails no longer connect to one another), then picked VA 360 back up. US 501 follwed VA 360 to US 360, then US 360 to VA 92 which US 501 followed to Clover. US 501 then followed SR 716 and SR 715 east out of Clover to use Mosley's Ferry across the Roanoke River (pretty close to the current US 360 bridge) into Charlotte County. It appears US 501 resumed on SR 705 Mosley Ferry Rd in Charlotte County over to VA 92. US 501 used VA 92 to JOnes Store, then SR 624 northeast to current US 15. US 501 followed US 15 through Wyliesburg, then US 15-360 northeast. A little past SR 628, US 501 veered more northerly on abandoned routing, then picked up SR 713 Deuprees School Rd to VA 47, then Woodland Ln and Ferraro Ln northeast back to 15-360. After Walkers Store, US 501 used SR 622 Old Kings Rd, then US 15-360 Business through Ontario. US 501 used 15-360 Business through Keysville except I believe it used SR 629 Southern Dr south of VA 40. North of town, US 501 followed modern US 15 north to SR 6584 Cabbage Patch Rd east, then US 360 east past Simplicity, then used today's SR 701 to Meherrin, then SRs 728/630 where it picked back up today's US 360. US 501 followed today's 360 until outside Burkeville, where it picked up SR 621 Burkes Tavern Rd east to end at SR 716 Namozine St (then-US 60 and VA 10). 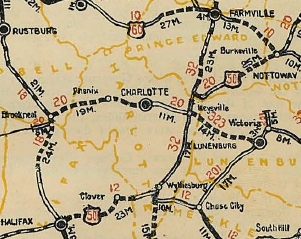 Adjustments:In 1930, US 501 was put on today's VA 92 from Clover to modern US 15 and used 15 northward. This left behind Charlotte CR 227. In 1931, US 501 was straightened out east of Halifax onto the current VA 360 alignment, leaving behind all those "trails" as CR 15 and 120. Also in 1931, US 501 was rerouted to use today's US 360 directly northeast of Keysville to Simplicity instead of US 15/SR 654. In July 1933 (CTB), US 501 was radically altered. Everything from Halifax northeast to Burkevile was renumbered as US 360. Instead, US 501 was sent north replacing VA 18 to Lynchburg, then replacing US 60/VA 14 up to its new endpoint - US 60 in Buena Vista. More specifically, US 501 crossed the Bannister River slightly east of today's bridge, picking up Sedge Hill Trail, then modern 501, then abandoned routing, then SR 615 Dudley Rd and more 501. US 501 used SR 610 Murphy Grove Rd and SR 643 Cedar Fork Rd. After some modern 501, the route used SR 643 McKendree Church Rd and SR 755 Bradley Rd. US 501 likely used Parsonage Rd and Millstone Church Trail Loops. Google Earth view seems to show a number of abandoned loops with no names heading northward. US 501 used SR 907 Thorton Jim Trail and SR 851/761 Boxwood Rd approaching Volens. It appears US 501 more or less used its current alignment to the Roanoke River. It appears US 501 used Main St to VA 40 at Brookneal, then west to pick back up modern 501. US 501 followed its current route to Rustburg except it used SR 917 through Naruna. After Rustburg, US 501 used SR 894 Kelly Rd, 501, and SR 898 Trestle Rd back to US 501. 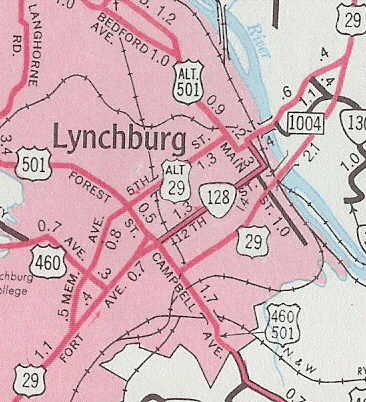 US 501 followed its current path except for Turf Rd (around SR 670) and SRs 1029/1030 (around SR 667) as it approached Lynchburg. US 501 followed US 501 Business, then used Campbell Ave instead of Kemper St. to 12th, then 12th over to Main which becomes Rivermont Ave. US 501 followed this out to current 501 BUsiness and mainline 501. Heading north, US 501 likely used Peakland Pl and a couple Old Boonsboro Rd alignments, but otherwise followed today's 501 pretty much to Buena Vista. 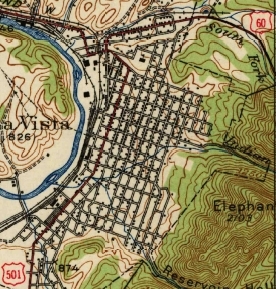 US 501's original route in Buena Vista was to use Magnolia Ave, then west on Park to end at Beech (US 60 used 29th St, Beech, Factory St, Alleghany Ave and Orchard Ave back then). Also in July 1933, US 501 was put on its current path between South Boston and Halifax as a renumbering of VA 321. The old route became VA 129. 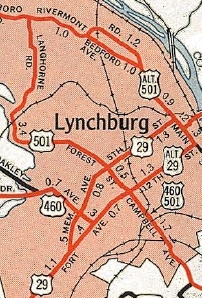 In 1936, US 501 was given its first bypass of Lynchburg, using today's US 501 Business along Langhorne Rd. 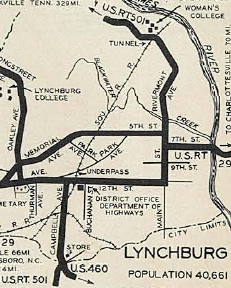 The old route through downtown Lynchburg became US 501 ALT. In Feb 1937 (CTB), US 501 was removed from SRs 894/898 in Rustburg. In March 1937 (CTB), US 501 was removed from SRs 615/610/643 north of Halifax. In Dec 1938 (CTB), US 501 was rerouted in Buena Vista to its current endpoint, replacing a bit of US 60 which was placed on its current routing. Back then, the intersection had a Y setup with the western leg being US 501Y. In Dec 1947 (CTB), US 501 was removed from SRs 1029/1030 north of Rustburg. By 1958, US 501 was removed from SRs 865/866 near the NC Line. 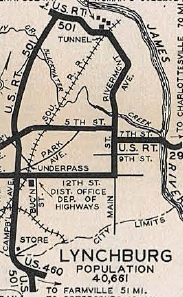 In 1958, US 501 was given its current Bannister River routing. In May 1963 (CTB), US 501 was given its current alignments south of Volens. In Jan 1967 (CTB), US 501 was given its bypass of Naruna. In Feb 1969 (CTB), US 501 was rerouted in Lynchburg to use Kemper St north of Edmond. Maps show a one-way split alignment between 12th and today's US 29 Bus, most like involving Buchanan St and either 14th or 15th. In March 1972 (CTB), US 501 was given its one-way split routing through South Boston. In 1981, US 501 (with US 221 and US 460 Bus) was removed from a one-way split between 12th St and US 29 Lynchburg Expressway. 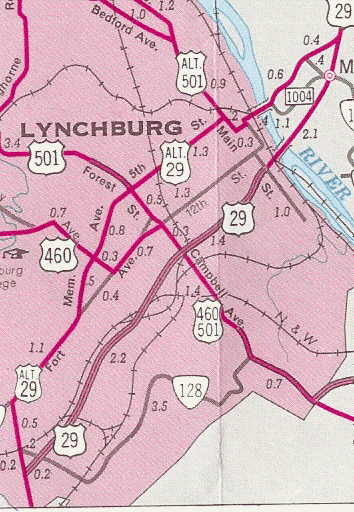 Around 1989, US 501 was given its current freeway routing around the west of Lynchburg, replacing what had been part of VA 291. Mainline US 501 via Langhorne became US 501 Business. About 2004, US 501 was placed on what had been US 501 ALT through Buena Vista, leaving behind US 501 BUsiness and some unposted routing. Improvements: Upon designation in 1926, US 501 was fully paved only from South BOston to Halifax. The 1931 Official shows no other segments paved, while the 1932 Official shows the original US 501 routing to Burkeville fully paved. The 1933 reroute to Buena Vista was already paved. The First segments of US 501 to be 4-laned were in 1952, from South Boston to Halifax and also on its US 460 duplex east of Lynchburg. 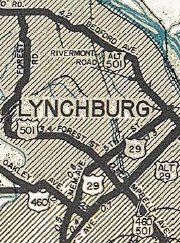 By 1961, US 501 was multilaned on a short segment north of 8th St in Lynchburg. 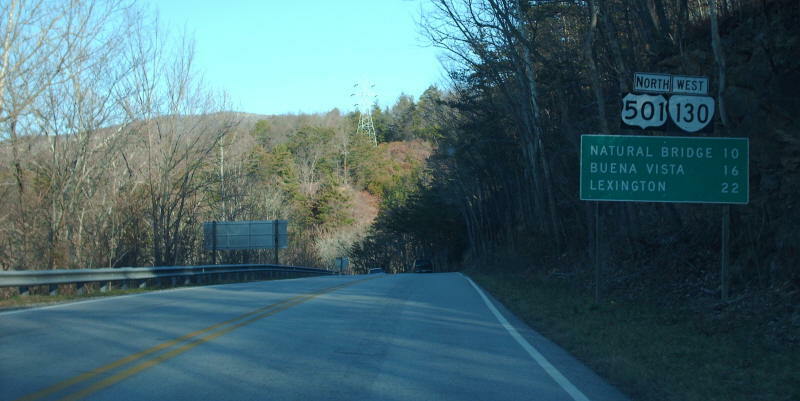 In 1986, US 501 was multilaned from US 460 south to the Lynchburg-Campbell line. In 1988, US 501 was multilaned a couple more miles further south into Campbell County.Templeton. In 1990, US 501 was multilaned on its freeway bypass of Lynchburg around to about US 221, plus at the Wigginton Rd interchange. In 1992, US 501 was multilaned from VA 96 to about Cluster Springs; also widened further south to nearly Rustburg. In 1993 or 1994, US 501 was multilaned from Cluster Springs to South Boston. In 1997 or 1998, US 501 was multilaned from the NC Line to VA 96. The last known US 501 cutout was facing the wrong way onthe SB alignment of the route through South Boston, which was removed in the early 2000s. Truck Route: A very well-posted truck route exists for South Boston, using US 360 and Hamolton Blvd. It goes back to at least the 1990s. Following US 501 BYPASS through Lynchburg requires 3 different interchange ramps, as well as two at-grade turns. On one random road trip in 1996, I crossed the VA/NC border at various points near US 501 to see how they marked the state line on back roads. VA didn't mark it real well, but NC went through the whole Welcome To/State Speed Limit/Buckle Your Seatbelts spiel on one back road. On a more minor back road that was unpaved, NC still had a state line sign, but managed to do without the other signs. Creation: Appeared about 1989 as a renumbering of the original US 501 bypass of Lynchburg. See scan in US 501 main entry. Improvements: Paved upon inception; brief multilane portions in the VA 163 area. Comment: US 501 Bus runs through some large residential areas. Creation: Appeared about 2004 as a renumbering of some of US 501 in Buena Vista. Posted: Fully posted at each end; there is no posting NB to make the turn from Magnolia onto 22nd St. Comment: US 501 Bus does not exist in the 2010 traffic log. I found this to exist by driving by it in 2004. Previous US 501 ALTs: US 501 ALT #1: Appeared about 1936 as a renumbering of mainline US 501 through central Lynchburg. Initially the route began at US 501 Campbell Ave and used 12th St Main St, Rivermont Rd and Bedford Ave out to Boonsboro Rd. 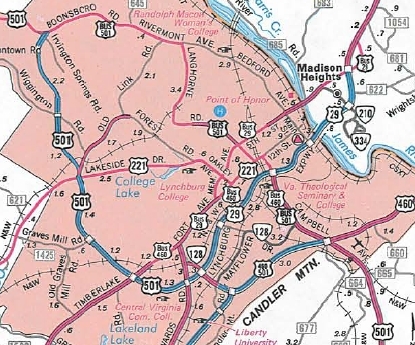 Around 1947, US 501 ALT was put on one-way splits in northern Lynchburg, using Bedford Rd (SB) and Rivermont Rd (NB). In Sept 1959 (CTB), US 501 ALT was removed from 12th St and was using only 5th St. This changed the south terminus of US 501 ALT. 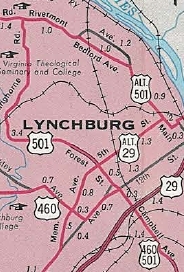 In 1963, US 501 ALT returned to just using Bedford Ave in northern Lynchburg. About 1989, US 501 ALT was decommissioned to non-primary status except for 5th St which remained US 29 Business (now VA 163). US 501 ALT #2: Appears in the 1957 VDOT Route Log but not the 1949 one, although it appears on the 1946 Rockbridge County map. Ran along Sycamore Ave through downtown Buena Vista, one block west of mainline US 501. In 2004, US 501 was realigned along the alignment of US 501 ALT. The 2010 traffic log erroneously suggests US 501 ALT still exists. US 501 ALT was not posted as far back as the early 1990s which was my first foray into Buena Vista. US 501-Y: Appeared Dec 1938 (CTB) as 0.04 mile of a leg at the junction of US 60 and US 501 in Buena Vista. This junction was a Y setup initially. It is unclear how long this intersection was set up this way but today there is no triangle setup. The 1950 USGS Topo shows the triangle setup - look closely at the scan to the right. 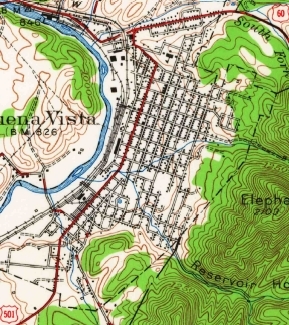 The 1963 Topo map shows the intersection as it looks today.